First, a quickie history lesson. Thurgood Marshall was the first African American Supreme Court Justice of the United States. His great-grandfathers were slaves. He was the attorney in the famous case Brown v. the Board of Education, arguing that racial segregation in school was illegal. He sat on the highest bench starting in 1967, two months after the riots in Detroit. You will see and hear about none of the above in the movie that bears his name in the title. That’s problem No. 1. In fact, Marshall doesn’t probe into Marshall’s groundbreaking life or career at all. 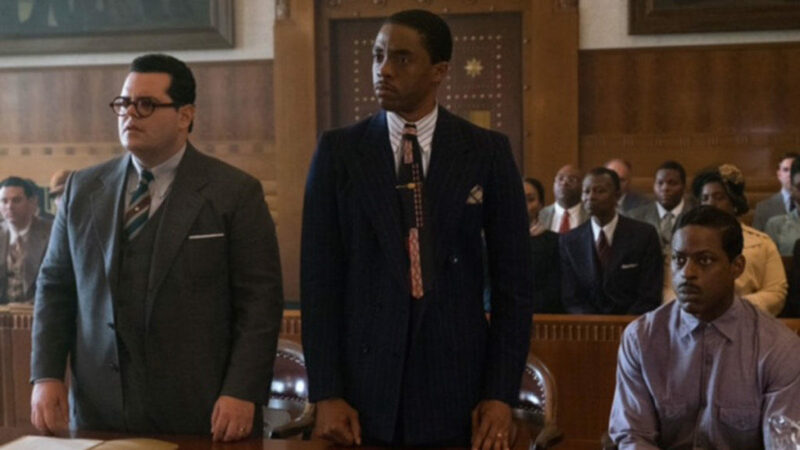 This is essentially a buddy movie, detailing the one time a young, idealist Marshall (Chadwick Boseman) had to team up with a Jewish attorney (Josh Gad) to defend an African American man accused of assaulting a white woman. The case is full of twists, but it feels like a footnote overall. Walk away from the straightforward drama and you will learn this iconic figure . . . was a pretty decent lawyer in 1940. Is he telling the truth? We get numerous Dateline-esque recreations, each presented from different point of views. Brown’s casting as the defendant is nothing short of a coup. He’s so earnest and big-hearted in his Emmy-winning role in This is Us that we’re naturally inclined to believe every word coming out of his mouth. He even tried in vain to do the right thing as Christopher Darden in American Crime Story (another Emmy!) Meanwhile, Hudson sells herself admirably as the woman done wrong. It’s nice to see her do fine dramatic work. Something has to give. But the story behind the story is beside the point. 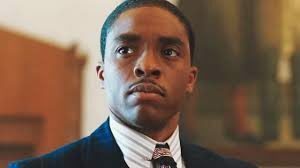 For Marshall to win his case, he must get a big assist from his co-counsel. Their dynamic is the heart of the film. Gad’s Samuel Friedman is a local Jewish attorney who specializes in insurance fraud. He’s never tried a criminal case. He gets tasked with the case more for window-dressing purposes. But the elderly, racist judge (James Cromwell) rules that Marshall is not allowed to try the case because he’s not a member of the Connecticut bar. He’s not even allowed to utter a word in the courtroom. A flustered Friedman must now take the lead. He does it reluctantly, with Marshall furiously scribbling notes at the defendants table to help guide him. 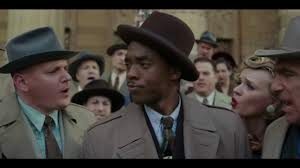 As always, Boseman is strong and smooth. Marshall, though only in his 30s at the time, carries himself like a man who knows that he’s special and destined for greater things. Seven years before Robinson broke the color barrier in Major League Baseball, Marshall shrewdly handles his outsider status and blatant prejudices lobbed against him. We never see him sweat, and his life beyond the courtroom holds little weight. It’s unclear whether this is a glimpse into Marshall’s true personality or if the character is just woefully underwritten. Gad owns the real breakout performance, as Friedman is the only person on screen with a true narrative arc. He starts as a befuddled insurance attorney doing laps in a pool in a one-suit. He ends as a civil rights champion. Marshall doesn’t stick around to hear the verdict. He gets reassigned to a different case and takes the first train out of town, almost like Batman getting the signal in a different city. Yes, Marshall is a real inspirational hero. Alas, that doesn’t mean a chapter in his origin story — even a well-intentioned one — is a worthy must-see.